Lettuce Mix // Store loosely in a plastic bag until ready to use. Should last up to a week. Cabbage // Cabbage is one of the best storage vegetables. It can easily last three weeks to two months. You don’t need to do much to it. Keep it in the fridge in the crisper drawer. A plastic bag can help retain moisture, but it doesn’t matter much. The two outside leaves are used as storage leaves. Remove them before eating. The longer you store the cabbage, the more layers you may have to peel away. Curly Kale // Lasts at least a week if kept moist. Kale doesn’t taste as good once it’s dried out. Keep it in the crisper drawer of your fridge or loosely in a plastic bag to seal in the moisture. Also freezes well for soups. Carrots // Refrigerate carrot roots in a plastic bag. They will easily keep for 2-4 weeks this way. Beets // Beet roots will easily last a couple of weeks to a couple months. They’ll get soft after that but can still be used. Store the roots loose in the crisper drawer of your fridge. Purple-Top Turnips // Store loose in the crisper drawer of your refrigerator. You can also store them in an open plastic bag to best retain moisture but they may mold faster. Either way, turnips can store weeks if not months. Rutabaga (Large Shares Only) // Store loose in the crisper drawer of your refrigerator. You can also store them in an open plastic bag to best retain moisture but they may mold faster. Either way, rutabagas can store weeks if not months. Celeriac (Large & Medium Shares Only) // Store in the crisper drawer of your fridge with the skin (and dirt) left on. Root vegetables store much better before they are washed. You can also store in a plastic bag or plastic wrap to help it keep longer. It should last 4-6 weeks with no issues. After that it will soften but still have great flavor. Watermelon Radish // Store in the crisper drawer of the fridge for several months. Purple or White Daikon // Daikon always seems to last for forever in the crisper drawer of my fridge, especially if it has not been cut. It will get a little soggier the longer you store it, but will still work quite well pickled. Use within a month or two and you should be a-okay. Butternut Squash (Large & Medium Shares Only) // Store winter squash in a cool, dry place and try to use within a week or two. Do not store in the fridge! This will cause it to spoil much more quickly. Oneida Gold Potatoes // Store just like you’d store any bag of potatoes from the grocery store: in a cool, dark place. Out of the light, they should keep for at least a couple months. Leeks // Store in the fridge and try to use within the month. Store in a plastic bag for best storage. Yellow Onions // Store along with your potatoes in a cool dark place. Use any that feel soft first. Should last several months. Shallots (Large & Medium Shares Only) // Store in a cool dark place until ready to use. These have been cured and should store for months, though you should use within a month for best quality. Use any that feel soft first. Thyme (Large & Medium Shares Only) // Store in the fridge. For long term storage and drying instructions, see here. Sage (Large & Medium Shares Only) // Store in the fridge. For long term storage and drying instructions, see here. The items in your share are the kind of things that sustain Wisconsin vegetable farmers all winter long. Most of us enjoy making a game of sourcing from the root cellar or fridge all winter long. In other words, aside from the kale (which I encourage you to freeze if it’s too much for you to consume raw) and lettuce, you needn’t be in any hurry to use up this box of goodies. Some of the roots will soften over time but they will still taste just as amazing roasted, pickled, and tossed into soups. The text below will have lots of tips on storage so that you can maximize the life of your veggies. There also may be some things that are new to you. 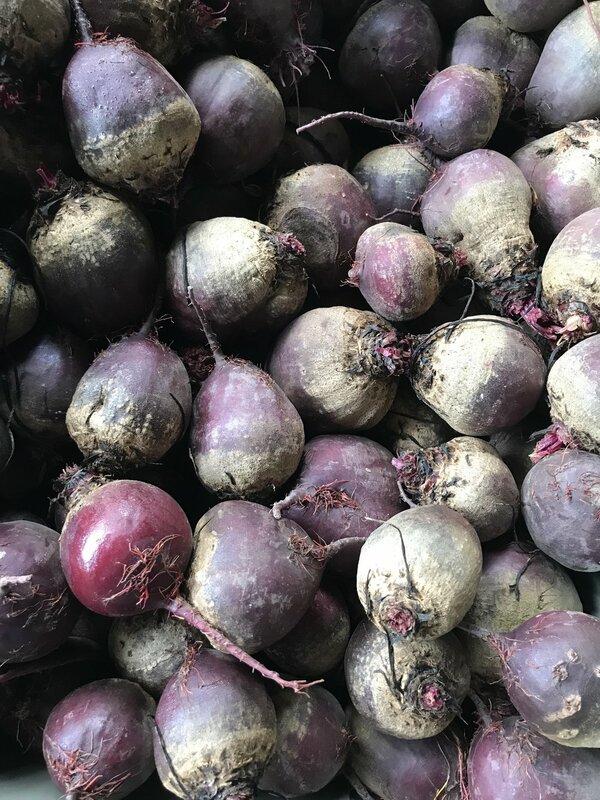 Even if you’ve gotten a CSA box from us before you may never have had to deal with any quantity of purple top turnips, beets or radishes. Don’t worry. You will also find tons of vegetables IDs and recipe suggestions below. A quick scan will show you soups, salads, roasted veggies and so many bowls of goodness. It is our hope and our goal to help you love Wisconsin winter eating just much as we do. I think my favorite thing about looking at a box like this is the reminder that local eating doesn’t have to boring or brown or bland in the cooler months. The contents of this box are colorful and varied. They will add a lot of flavor and interest to your meals. Thank you all so much for taking Raleigh’s Hillside Farm produce into November with you. It feels so good to end our season with a massive harvest and delivery of bounty. After today’s delivery there is very little left to do in the fields. We’ll be mulching the garlic on Friday and hoping to seed some late cover crops of winter rye before this weekend’s forecasted snow. Then we’ll roll up all the remaining row cover (that had been insulating so many of the crops we harvested for you on Monday), move it out of the field and into our pack shed and the 2018 season is a wrap. Only record keeping, book keeping, marketing, and business planning and visioning left to do for the farm this year. Thanks for being a part of a great ending to a year that has been so hard. Your support of us through a difficult season is not only appreciated but also essential to our long-term success. Having a bountiful storage share and ending the season on such a high note helps us go into our year-end review and goal setting for next year with such positivity, aspires and joy. Happy November everyone! May it be delicious! PS If you need more ideas for recipes, be sure to head to the farm’s Pinterest account where you will find recipe boards categorized by vegetable! Rutabaga and Purple Top Turnips are not so different. They both fall into one of my favorite categories of delicious savory storage root vegetables. They are both in the brassica family and even look alike with purple tops. They have subtle almost radish or kohlrabi-esque flavor. See the pictures below to identify but note that you can absolutely substitute one for the other without issue. Celeriac is not the prettiest vegetable you will ever encounter and because of that fact, folks often think they're not gong to like it. But celeriac is a wonderful fall veggie with loads of flavor. It's also a long-season crop (meaning it takes over 100 days to grow) with tiny seeds and for that reason, this is our first time actually growing it successfully. It's a hard crop to grow and we have often lose ours to the weeds. This year we transplanted the delicate crop in late May and kept it in a low field with lots of shade and lots of moisture. It did very well here! We're so excited to have celeriac for our members for two weeks! Some people call it celery root as it is essentially a celery plant bred to grow large roots instead of large stems and leaves. It tastes much like celery but with a more nutty, sweet flavor. It's also rather starchy and potato-like. First and most importantly, you are going to need to peel the celeriac and you will want to do so aggressively. I cut off both ends and then peel it with a knife rather than a vegetable peeler. I'll lose a little bit of flesh this way but its a much faster and easier way to peel it. Then the options are limitless! I love celeriac mashed with potatoes. It's great in soups to impart a little creaminess and celery flavor (you can always sub it for celery in soups). Even just roasted with a bunch of other root veggies, celeriac really shines. But if you want to find some more creative ways to use this interesting veggies, head over to Rodale's Organic Life. They have some really awesome ideas for how to use your celeriac! Daikon is not all that different from a regular radish (crisp and sweet with a little bit of spice). The main difference is just that it's MUCH larger. Daikon can get anywhere from 3-15 inches long. You can enjoy them raw, sliced, shaved, or cut into matchsticks. They add a great crunch to pretty much any dish with just a very subtle spice. In fact, because they were in the ground through a few frosts they will actually be a bit sweet. I especially love to pickle daikon and toss them on sandwiches or grain bowls. Have fun experimenting and if you want to learn more about this unique veggie: head over to Food 52 where they give you loads of information and ideas for how to use it. Leeks are the super tall vegetables in your box this week that look almost like a giant green onion. These are one of my all time favorite veggies and I hope you learn to love them too! They are in the allium (onion, garlic, shallots, etc) family so have that delicious allium flavor. They can be used any place where you would use an onion but I LOVE them in potato leek soup! To use them, you want to cut a tiny bit of the bottom off (the fringy part that was in the ground) as well as the leaves (use the parts that are white and pale green, skip the parts that are dark green- though they can be used for soup stock) and you can then cut them into rings or slice the leek in half and slice it much as you would an onion. For more info on leeks and how to cut them, head over here! The pretty pinkish purple thing in your box this week that looks a lot like an onion is actually a shallot. Their flavor is a lot richer and sweeter than an onion. They lend a lot of flavor to any dish, but I really love to mince them finely and use them raw in salad dressings made of buttermilk or caramelized and the focus on a pizza or other savory dish. I also love to use them in any salad that calls for raw onions because they have the perfect amount of subtle pungency. Early on, Lauren's mom instilled in her a great love of cooking. She's always had a garden and knows what to do with abundant produce better than anyone. We hope you enjoy her classic Wisconsin preparations of summer abundance. Preheat oven to 350 degrees, bake potatoes directly on oven rack for 1 hour. Remove from oven, set aside, let cool to the touch. (I’ve even baked, cooled and refrigerated them until the next day). Cut potatoes in half lengthwise, scoop out middle leaving ~1/4” shell. At this point can cut them in half crosswise. Preheat oven to 425 or 450 degrees. Place skins upside down on greased baking sheet, skin side up. Brush with melted butter, sprinkle lightly with salt. Bake shells 20 min. until crisp and golden brown. Meanwhile, dice, cook and drain bacon or pancetta. Drain on paper towels. Soften cream cheese, cream, stir in bacon, egg, romano cheese, thyme or sage, and garlic (+ other seasonings if desired). Take potato skins out of oven, turn right side up, divide filling evenly between them. Top with mozzarella cheese. Return to oven, bake for another 5 minutes. .
Every week I'll share the links to some of my favorite recipes for the produce in your box from my own blog as well as my favorite bloggers and chefs. I am a master recipe substituter so be sure to read my notes before clicking through to see what vegetables I am swapping for others and how I adapt favorite recipes time and time again with whatever is in season! Though some of the recipes I share may look complicated, I also love sharing tips for streamlining or suggesting other preparation suggestions in the notes of the recipes. 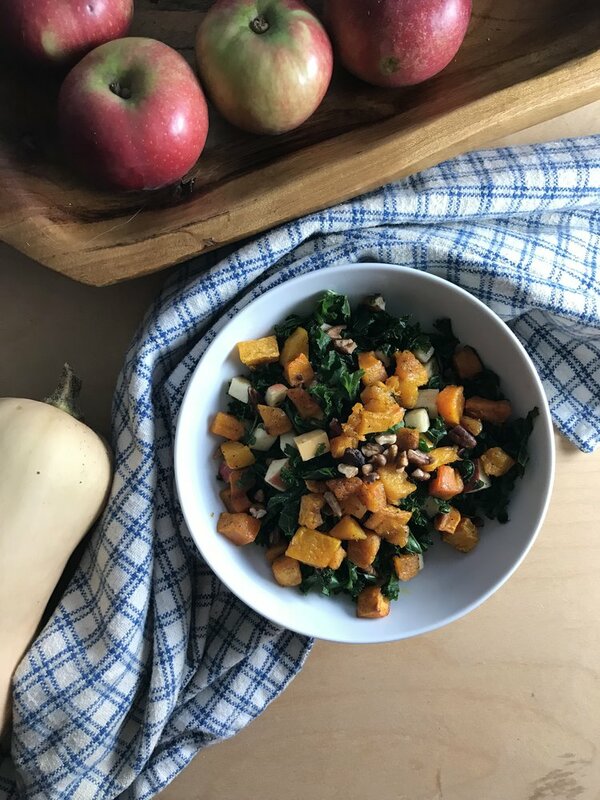 Favorite Kale Salad with Roasted Butternut Squash, Apples & Cheddar // Kale, Butternut Squash // I shared my favorite kale salad recipe many newsletters ago. It had tiny pieces of cubed apple and cheddar cheese with a simple lemon juice dressing. Now that it’s fall I’ve tweaked this awesome salad ever so slightly adding roasted squash and a sweet tangy vinaigrette of apple cider vinegar, maple syrup and olive oil. An upgrade suitable for fall indeed! Sesame Noodle Bowls with Lemongrass Meatballs // Carrots, Daikon // For some reason or another, this dish has turned into a winter staple in our house. I love the combination of hot meatballs, sesame noodles, pickled winter veggies and a cool creamy sauce. If you are stumped on how to use those daikons, make this recipe on repeat all winter long! PS. The cashew sauce is the only part of this recipe I find complicated so we often do a sauce of mayo, yogurt, sesame oil and sriracha instead! Beet Citrus Salad // Beets, Shallot, Sub Lettuce Mix (or Kale) for Arugula, add Watermelon Radish // If you haven’t quite figured out how to love beets yet than I challenge you to try this salad. With sweet candied nuts and delicious winter clementine, orange and/or grapefruit segments, the beets melt into something that resembles a bright, earthy candy. Feel free to also add some pieces of quartered and sliced watermelon radish! Roasted Roots with Turmeric Tahini Sauce // Rutabaga, Turnip, Carrot, Sub Potato for sweet potato (unless you still have some), and skip the parsnip altogether // This box is just begging to be roasted. All those root veggies will taste swell together, especially if covered in a delectable sauce. This simple turmeric tahini sauce is rich, vibrant, healthy and hearty at once. It’s sure to be a new favorite. Watermelon Radish Toast with Miso Honey Butter // Watermelon Radish // If you haven’t had watermelon radishes yet, I hope this recipe helps you understand the joy and beauty they bring to cold month tables all around the Midwest. Watermelon radishes have this perfect blend of spice and sweetness that deserves celebration all on their own, but then you slice them and see where the real excitement lies. These radishes are a beautiful addition to any table and any meal. And because of their subtle flavor you can keep it simple like done here, just throwing them onto your morning toast. Leek Soup with Shoestring Potatoes // Leeks, Potato, skip the Garlic and Parsley // A CSA member reminded me of this favorite recipe over the weekend and I’m so overjoyed that they did. I made it for a farm to table event a few summers ago without the fried herbs (mine just turned into a greasy mess) and added a simple jalapeno oil (poblano oil would also be fabulous). The soup has a lot of butter and a lot of cream, actually a lot of dairy generally, but don’t let that stop you. It’s the best leek soup you will ever eat. Cabbage Salad with Squash, Beets & Rotisserie Chicken // Butternut Squash, Beets, Onion, Cabbage or Kale for red cabbage // I developed this recipe right before leaving on vacation and then attempted to eat it every single meal. Then I made it again as soon as we returned from vacation. This salad is a WINNER! Equal parts simple, healthy and incredibly filling. And I know you aren’t receiving red cabbage from us but I have a sneaking suspicion that green cabbage or kale would be just as lovely as a base for this salad. Enjoy! Radishes with Buratta // Watermelon Radish // You may think you aren’t a big radish person but let me just tell you that you are WRONG and that watermelon radish will change your mind. My all time favorite watermelon radish recipe is just sliced watermelon radish, sliced carrot, an avocado and a ton of garlic, olive oil and lemon, but I couldn’t find that recipe so instead you get my second favorite. It’s a bit fancier with the expensive cheese but a beautiful, delicate way to appreciate radishes and let them be center stage. Yum! Crock Pot Pork Carnitas with Roasted Vegetables // Celeriac, Carrots, sub Potato for Sweet Potato, skip the Parsnips sub some Turnips or Parsnips, leave out the Broccoli or Brussels Sprouts // Slow cooker + sheet pan and a boat load of vegetables. My favorite kind of cooking. Simple, healthy, quick to pull together, delicious. What’s not to love? Spicy Kimchi Slaw // Sub regular Cabbage for Napa cabbage, Daikon Radish, Carrots // Napa cabbage and daikon radish are a match made in heaven, but I didn’t want to give you a kimchi recipe because I know most folks won’t go home and make a vat of kimchi (but if you do happen to want to, check out this great recipe). This recipe calls for prepared kimchi mixed with Napa, daikon and carrots for a light, bright salad that would taste great paired with some ribs or fried chicken. The only veggie it calls for that we didn’t give you is scallions, and I recommend buying some because scallions are an essential part of kimchi. Lentil Vegetable Shepherd’s Pie // Onion, sub Turnips for the Parsnips, use just Potatoes for the topping // My all-time favorite way to eat rutabaga is simple: mash it up and serve it with butter and a bit of maple syrup. The caramel-y notes of rutabaga make the best mashed vegetable you’ve ever had. However, it’s not November and mashed rutabaga seems a bit premature for the season. So, instead, try this. Mashed potatoes a top of slew of other veggies, mushrooms and lentils for a healthy light version of one of my favorite childhood meals. Sheet Pan Chicken with Cabbage & Leeks // Cabbage, Leeks // I need more recipes like this: recipes that come together on ONE PAN and require next to no dishes but are still absolutely delicious. This recipe is a sure winner! The Ultimate Veggie Burger // Beets, Sub Festival or Butternut Squash for Sweet Potatoes, Onion // It’s the burger of your dreams, and guess what, it’s totally vegan. Whoever thought of adding sweet roasted sweet potatoes (or squash) AND guacamole to a burger is pure genius. Celery Root & Carrot Soup // Celeriac, Carrot // Celery Root or Celeriac is a beautiful fall vegetable with the flavor of celery, but the creaminess of a potato. It’s delicious roasted, but I think it shines best in soups. With accents of apple and ginger, this soup is everything I love about warm fall flavors all in one lovely bowl and I just adore it. Fall Harvest Apple & Kale Salad // Kale (or sub lettuce), Shallot, Thyme, add some thinly sliced radish // This salad came out just a couple weeks ago and I’ve already stared at the photo longingly five times. I finally made it this past weekend and it is every bit as perfect as it looks. And a great way to use up kale if you aren’t a huge kale fan. You could also sub lettuce for the kale if you prefer that as a salad green. Root Vegetable Gratin // Onion, Potatoes, Celeriac, skip the Sweet Potatoes // Rutabaga, celeriac and potatoes can all absolutely stand alone, but I’m just in love with making them the star trio of pretty much any root vegetable dish. This lovely gratin calls for totally different vegetables (fennel, celeriac and gold potatoes) but onion, turnip, rutabaga and russet potatoes will be equally (if not more) delicious. Crockpot Caramelized Pork Ramen Noodle Soup with Curry Roasted Acorn Squash // Carrots, sub Butternut Squash for acorn squash, sub Leeks for green onions, add some daikons or watermelon radish cut into matchsticks // This clearly qualifies as a PROJECT recipe. I prefer not to share project recipes for all you lovely members because I know your preference is usually to cook maximum vegetables in minimum time with limited crazy techniques and/or ingredients, but this recipe, this recipe is oh so worth it. And it uses a crock pot, so that equates ease, right? Bok Choy // Store unwashed in the crisper drawer of your fridge. Use within a couple days for best texture. Greens will wilt relatively quickly. Stems will retain firmness a while longer. Lettuce Mix (Full Shares Only) // Store loosely in a plastic bag until ready to use. Should last up to a week. Lovelock Lettuce (Half Shares Only) // Store loosely in a plastic bag until ready to use. Should last up to a week. Beans (Half Shares Only) // Refrigerate in a plastic bag and use as soon as possible. They are quite perishable. Broccoli (Most Full & Half Shares) // Store in the crisper drawer of the fridge. The colder the better for broccoli. Try to use within a few days. Brussels Sprouts (Full & Half Shares who did not receive Broccoli) // Take out of plastic bag and store in a bowl or open container in the fridge. Do not trim or discard outer leaves before storage. Brussels sprouts should last up to a month this way. The outer leaves might get a little shriveled but you typically remove them anyway. Purple-Top Turnips // Store loose in the crisper drawer of your refrigerator. You can also store them in an open plastic bag to best retain moisture but they may mold faster. Either way, turnips can store weeks. Rutabaga // Store roots separately loose in the crisper drawer of your refrigerator. You can also store them in an open plastic bag to best retain moisture. Greens will last a few days. Turnips will last weeks. Russet Potatoes // Store just like you’d store any bag of potatoes from the grocery store: in a cool, dark place. Out of the light, they should keep for at least a month. Yellow Onions // Store along with your potatoes in a cool dark place and try to use within a couple weeks. Well, what can I say? We made it! What a truly unbelievable year of growth, strength, struggle, love, patience, and new possibilities. Even before this season became what it was (a remarkable feat of working to survive the weather) we were taking on a lot. We just keep packing more in than ever before. This year we added so many new things. A new box option (flex shares) and a new share style (market shares) were just the beginning. Wow, oh wow. What a year my friends! Can you believe we’re here in the midst of week 20? Can you believe we made it? Honestly, we didn’t know if we would. Yes, the weather had a lot to do with it, but we also just keep packing more and more in than ever before. In April, we built a second greenhouse and bought our first tractor. We had snow, we had hail and when the weather finally cleared, we hit the ground running. That next weekend was over ninety. We worked hard in the fields and in our downtime met with several phenomenal local growers and producers to figure out terms and schedules so we could offer add-on shares of flowers, apples, beef, coffee and maple syrup to our members. In May, we figured out all the logistics of how this would actually work. In June we started delivering them. It happened that fast and I loved how they turned out. We also made time to meet with contractors to figure out how to move forward with our much-needed pack shed. (We had originally planned to have it built last year only to realize the location we had in mind was totally unsuitable which caused a dramatic pivot when we decided over the winter that we would build it ourselves. The laborious task of building a second greenhouse while also trying to get a farm planted for the season taught us a quick lesson. Farmers can’t also be builders during summer). The saga of the pack shed continued. It’s still not quite complete. In June, it rained and rained and rained. The fields were soaked. The weeds were wild. The weekends were long and we realized quickly that our crew was essential not only for labor but for keeping us going. Their laughter and good energy was essential to our not breaking down when the work was greater than ever before. We handled it with relative ease. Things were hard but we knew how to move forward. When to reseed, when to admit defeat, and how not to lose crops to voracious weeds. In July, we partied. We hosted 60+ people on a warm July night. We ate well, we played with farm cats, and we lingered around a bonfire late into the night. It was easily our most well-attended and joyous party to date, and then construction of the pack shed finally began. We lost a cat, we found another. We laughed. We cried. We savored the only dry month of the whole damn summer. In August, our farm hosted an educational field day for aspiring farmers. Lauren taught 50 women what it meant to be a CSA farmer, a female farmer and part of a business partnership with your spouse. The next day we taught local folks how to preserve the harvest in our newly constructed packshed and then we pulled the majority of our onions out of the field to get them curing (before the impending rains) while hosting an all-day tour of our farm. We tried to get away for Kyle’s birthday. We failed completely. We grilled everything. We worked hard. We celebrated the first patch of cement next to our new pack shed with hand, foot and paw prints. We passed our fourth organic inspection. Then the rain fell. And fell and fell. We watched the tomatoes rot on the vine. We struggled to get fall crops into soaked ground. September came and we took an impromptu camping trip because the fields were to wet to get anything done. We reconnected as a couple. We let it all go. We released every ounce of pain this season had caused and realized we were handling a disaster season like champs and decided we could make it to the end. We hosted our first ever wellness event—something I hope becomes a tradition out here on our farm. It was beautiful and soul-nourishing, inspiring and cathartic. We dug 1200 feet of potatoes by hand. We laughed and laughed some more. We took ridiculous pictures. We lived in our rain suits. We forgot what the sun looked like and celebrated this season for everything it was: a totally beautiful, totally ridiculous, totally out of our control mess. October arrived and we let out the largest sigh of relief. We had plenty of produce in the field. It wasn’t timed perfectly. It wasn’t our usual impeccable quality. It wasn’t exactly how we planned it to be. But it was there, growing strong through drenched soil. We knew we could finish the season. We knew our members would end their year with us happy and satisfied. Then we stared at our unfinished pack shed and prayed it’d get done for the harvest party. It didn’t. We partied anyway. We hosted our first ever fall harvest party. We planned so many silly activities. We laughed more than even before. When I look back at this past season, there is certainly some sadness. This was our double down year. Our let’s get serious about this business and invest some money in ourselves year. It was a terrible season for that. We made big investments and weren’t able to see them provide any return. In one case, we haven’t even seen it’s competition yet. But when I look back there is so much more than just sadness or hardship. There is also immense pride in our strength, our knowledge, and our dedication. Because a season this bad didn’t break us. In one of the worst years for weeds on record, we lost the least amount of crops to weeds that we’ve ever lost. We kept up. Despite every curve ball and challenge, we kept up. We didn’t have to take a week off the CSA at the end. We didn’t even wind up giving any boxes that disappointed me. We fulfilled our obligations to our members and wholesale accounts despite all the odds being stacked against us. We grumbled, a little, but far less than usual. We survived. No, we THRIVED. During a year that broke many a farmer. It has been a year my friends. A year we will truly never forget. A year we loved deeply in-spite of the struggles. A year we will forever be in disbelief that we survived. Thank for joining us and loving us and your messages of kindness and support. Be not afraid of that leafy green vegetable with white almost celery-looking stalks in your box this week. Bok Choy is one of the vegetables I had never heard of before we began farming that I have grown to have a deep love for. It is a member of the brassica family (I'll mention the brassica family a lot; it includes lots of popular veggies like broccoli, cabbage, cauliflower and brussels sprouts as well as some odd ducks like kohlrabi, bok choy and rutabaga). It sometimes also referred to a pac choi or Chinese cabbage. This green is mild and sweet with an almost silky texture. A lot of dark leafy greens can be bitter or harsh, but bok choy is the complete opposite. The leaves are light and tender. The stalk is crunchy and crisp. The first step is getting it clean. We sprayed the field dirt off the bok choy, but dirt likes to hide between the layers. I fill my sink with cold water, rip off as many leaves as I plan to use and then soak them for 5-10 minutes. I rub my fingers over any dirty parts of the stem after they soak and then swish them through the water before use. Then all that's left to do is cut it up. This will vary a little bit based on what recipe you are using, but I like to cut the stems from the leaves. I usually roughly chop the leaves and slice the stems. CSA member Ben made this great video for how to cut it up. What is the best way to prepare bok choy? Because the leafy greens are so tender and the stalks so crispy, I love to eat bok choy raw in salads. There are two salad recipe belows that call for bok choy. My friend Sarah loves to grill bok choy because it stands up well to the heat. Lots of folks stir fry it or add it to soups. You can also make a quick ferment or kimchi out of it. I've also simmered it in coconut milk (ala creamed spinach, but vegan and so much better!) and that was one of my favorite simple preparation. The sky is the limit with this leafy green so be not afraid. You can learn to love it! In a large bowl, melt. butter and then whisk together with next 7 ingredients. Set aside. Grate potatoes coarsely, wrap in clean kitchen towel and squeeze some of the liquid out. Stir into butter flour mixture. Heat remaining oil and butter on griddle or large skillet, use heaping tablespoon of potato mixture for each pancake, flatten. Cook until golden brown on both sides. Pan Roasted Brussels Sprouts with Bacon, Date & Halloumi // Brussels Sprouts // Brussels Sprouts for everyone!!! Let’s celebrate by tossing them with literally all my favorite things: bacon, bread cheese (this is available all around Madison and a great substitute for halloumi) and dates!!!! Man I love fall! Roasted Roots with Turmeric Tahini Sauce // Rutabaga, Turnip, Sub Russet Potato for sweet potato (unless you still have some), use some of the carrots from last week, and skip the parsnip altogether // This box is just begging to be roasted. All those root veggies will taste swell together, especially if covered in a delectable sauce. This simple turmeric tahini sauce is rich, vibrant, healthy and hearty at once. It’s sure to be a new favorite. Blistered Green Beans with Creamy Tahini & Fresh Hot Sauce // Green Beans, leftover Jalapeno or other hot pepper // I discovered this recipe weeks ago now and have been waiting impatiently for us to have green beans again so I could share it with you. If you got sick of green beans this summer (like I did), trust me when I say you will be able to easily devour them in this delicious recipe. The heat, the creamy sauce, the char on the beans. It’s perfection. I did blanch my beans for 5 minutes first to ensure they got properly blistered while still being cooked through. Crock Pot Pork Carnitas with Roasted Vegetables // Brussels Sprouts and/or Broccoli, sub Turnips, Potatoes, and/or Rutabaga for Celeriac, Sweet Potato, Parsnip & Carrots // // Slow cooker + sheet pan and a boat load of vegetables. My favorite kind of cooking. Simple, healthy, quick to pull together, delicious. What’s not to love? Crispy Korean Rice Bowl // Bok Choy // This particular recipes asks you to make your own kimchi (which is incredibly tasty), but that step is absolutely unnecessary. Find a great jar of spicy kimchi at your favorite local store and stick to the delicious simplicity of rice, mushrooms and some coconut braised bok choy. Lentil Vegetable Shepherd’s Pie // Onion, sub Turnips for the Parsnips, Rutabaga, Potatoes // My all-time favorite way to eat rutabaga is simple: mash it up and serve it with butter and a bit of maple syrup. The caramel-y notes of rutabaga make the best mashed vegetable you’ve ever had. However, it’s not November and mashed rutabaga seems a bit premature for the season. So, instead, try this. Mashed potatoes a top of slew of other veggies, mushrooms and lentils for a healthy light version of one of my favorite childhood meals. Autumn Chopped Salad with Creamy Poppyseed Dressing // Lettuce, Arugula, Lettuce Mix // With so many beautiful greens in your box this week, you better be making a salad! 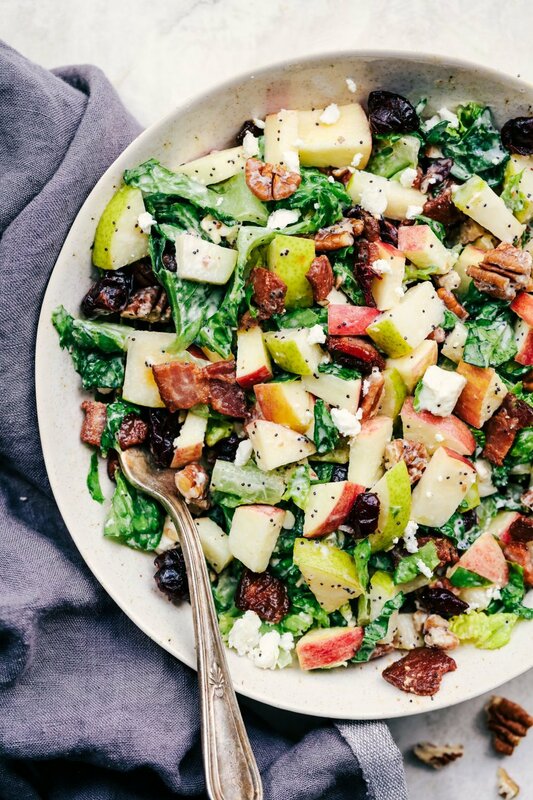 With arugula, head lettuce, or lettuce mix, this recipe is destine to be a dreamy fall dish with apples, pears, bacon, dried cranberries, pecans and feta cheese. Roasted Sweet Potato & Salmon Soba Noodle Bowl // Bok Choy, and hopefully you have some Sweet Potato leftover // Bok Choy is such a lovely and versatile green. It’s perfect raw in salad or cooked up in a bowl of noodles. I love it here with a simple salmon, roasted sweet potatoes and spicy sauce. Yum! Root Vegetable Gratin // Onion, Potatoes, Sub Rutabaga and Turnips for Celeriac and Sweet Potato (unless you still have some lying around) // Rutabaga, turnips and potatoes can all absolutely stand alone, but I’m just in love with making them the star trio of pretty much any root vegetable dish. This lovely gratin calls for totally different vegetables (fennel, celeriac and gold potatoes) but onion, turnip, rutabaga and russet potatoes will be equally (if not more) delicious. Raw Broccoli Salad with Fried Onions & Peanuts // Broccoli, Onion // A salad of raw veggies massaged in a mixture of oil, vinegar, sugar and fish sauce topped with fried things and crunchy salty nuts. How decadent! Here’s to more salads that don’t feel like salads. PS.I originally made this salad without kale so feel free to just make it with the broccoli. But also, if you got arugula and broccoli, maybe throw some of that beautiful arugula into the mix. Lettuce Mix (Half Shares Only) // Store loosely in a plastic bag until ready to use. Should last up to a week. Colored Bell or Italian Frying Pepper (Full Shares Only) // Refrigerate peppers, unwashed, in the vegetable drawer. Moisture makes them spoil faster so don’t store in a plastic bag. Beans // Refrigerate in a plastic bag and use as soon as possible. They are quite perishable. Brussels Sprouts // Take out of plastic bag and store in a bowl or open container in the fridge. Do not trim or discard outer leaves before storage. Brussels sprouts should last up to a month this way. The outer leaves might get a little shriveled but you typically remove them anyway. Kohlrabi // The kohlrabi bulb will last up to a month in the fridge. Use within a couple weeks if you plan to eat it raw. Celeriac // Store in the crisper drawer of your fridge with the skin (and dirt) left on. Root vegetables store much better before they are washed. You can also store in a plastic bag or plastic wrap to help it keep longer. It should last 4-6 weeks with no issues. After that it will soften but still have great flavor. Carrots (with greens) //Separate roots from greens. Wash greens and wrap in a paper towel and place in the crisper drawer of your fridge. They should last up to 5 days. Refrigerate carrot roots in a plastic bag. They will easily keep for 2-4 weeks this way. Sweet Potatoes // These sweet potatoes have been cured and can be stored much like regular potatoes: in a cool, dry place. A semi-dark spot in the basement or pantry will work best. Watermelon Radish //Store in the crisper drawer of the fridge and store up to a month. Rain, rain, and more rain. How are you all feeling with this recent weather? I bet it’s not far off from how we feel. We feel like hibernating— like it’s already November and time to bunker down even though we’ve still got two CSA boxes, a farm party, a storage share, $5000 of wholesale to sell, and a mountain of clean up to do. But the weather is signaling something else. The weather is telling us to stay inside not only because it’s so dang miserable outside but also because it’s truly too wet to even be out in the fields let alone get much of anything done. Honestly, it’s a rather fitting ending to a year that didn’t want to give us a break. Not in April when it was snowing. Not in April when it was hailing. Not in June when it rained excessively every day that our crew was out to help, not in August when we somehow got 22 inches of rain in ONE month, and not now. Everything is telling us to stop, to let this season go, to write it off and start planning for the next one. So we’ve been doing what we can and not a whole lot more, leaning into the rain. We’ve stopped fighting it. We’re spending more time at home. We’re using our energy to plan a ridiculously fun fall party, catch up with friends and family, and clean our basement. And we’re leaving for Hawaii in 10 days— less than 48 hours after the delivery of the last regular season CSA box. We had so much we thought we’d get done before we left but there’s only so much the weather will allow. We can’t mow. We can’t seed cover crop. We can’t plant garlic and we can’t roll up landscape fabric. We can’t get our cement poured or our water lines dug. It’s ok. We just won’t. And then we’ll come home to what has just got to be better weather and we’ll finish the season- full of more spirit, joy and determination than we could possibly muster in the midst of this rain. If there is anything farming has taught me, it’s that you have to learn to lean in. When the sun won’t stop shining, you work and you work hard. You take care of your body so you can put even more into this thing. You seize the opportunities that are there and then when the rain comes, when the winds come, when the weather demands you stop working, you listen. You do the bare minimum and then you go home and you do the things you wish you had energy for back when the sun wouldn’t stop shining. We never asked for such a dramatic lesson but it’s here. So we’ll listen. Despite the rain and the call for rest and projects at home, we’ll be spending today and tomorrow harvesting because there are still orders to fill. We will also be preparing the fields for the frost predicted on Thursday night (and what we expect to be an absolute in the impending weeks: cold that has the potential to damage our crops). Getting all this row cover laid now protects things from the cold but also gives them a boost, helping the vegetables that remain grow faster through these dark and cool days. It’s a lovely end of season balance: hard work and rest, celebration and sadness, sunshine and mud. And somehow it’s almost done. We so hope you’ve enjoyed this ride. P.S. Did you see that we’re having one more fabulous party at the farm?! Come join us! Kohlrabi is a member of the cabbage or brassica family. It is directly translated as cabbage turnip in German and that really alludes to the flavor. This vegetables has a strong brassica flavor. Once you remove the green or purple skin (more on that below), it essentially looks like a turnip, but tastes like cabbage. Kohlrabi retains a lot of water so it's crisp but softens when you cook with it. It is especially happy growing in cooler temperatures which is why you see them a lot in late spring or fall, but they are easy to grow year-round. The leaves are edible and can be compared to collards, but because you're already receiving so many greens this week (and because we weren't sure they'd fit in the box), we removed the greens. You just want to eat the white interior part of the kohlrabi, not the green or purple skin. You will need to peel it before cooking with it (but leave the skin on while it's in the fridge for best storage). I do this with a knife not a vegetable peeler. You want to remove both the peel and the fibrous tough skin beneath the peel. To do this, I cut off the top and bottom first so the kohlrabi can sit flat on my cutting board and then move down the sides with my knife, following the curve of the kohlrabi and letting the skin fall away. Once you are left with the semi-round peeled vegetable, you can cut into into chunks, matchsticks or slice it thinly depending on the recipe. What is the best way to prepare kohlrabi? You can eat kohlrabi a lot of different ways. You can just cut it into sticks and eat it raw with some veggie dip for a quick snack. You can use it raw in practically any salad (I added it to my favorite broccoli salad and it was amazing!) or make a salad that is all about highlighting the unique veggie. Cookie & Kate's Crispy Apple & Kohlrabi Slaw is delicious. I also love Wisconsin from Scratch's Spicy Thai Kohlrabi Salad. If you are nervous about eating it raw, you can also cook with it. I love it just simmered in some milk and then mashed like potatoes (especially if you throw in some of that green garlic!). You can roast it with other veggies just like you would a turnip. Things I Made Today turned them into gnocchi with kale. I've even seen it grated and turned into fritters! Try a few different methods and figure out which way you like kohlrabi best! Place carrots, butter, water and salt in small heavy saucepan. Bring quickly to a boil, cover pan, reduce heat. Simmer for 10 – 12 minutes or until carrots are crisp tender. Remove cover, continue to simmer until water is almost gone. Gently stir in dill. Crock Pot Pork Carnitas with Roasted Vegetables // Brussels Sprouts, Celeriac, Sweet Potato, leave out the Parsnips or substitute Carrots, leave out the Broccoli (and maybe put in more Brussels) // Slow cooker + sheet pan and a boat load of vegetables. My favorite kind of cooking. Simple, healthy, quick to pull together, delicious. What’s not to love? Slow Cooker Beef & Sweet Potato Chili // Sweet Potato, Sweet Pepper, feel free to add some carrots too // With this cool, dreary weather, a giant batch of chili is definitely in order. I pretty much always add sweet potato or butternut squash to my batches of chili now. It is just the bit of sweet complexity regular old chili always needed. Miso, Sweet Potato & Broccoli Bowl // Sub Brussels for Broccoli, Sweet Potato, toss some roasted Carrot & Celeriac in there too if you feel like it // The first time I made this dish I actually found it quite boring. Can you even imagine? Since then I’ve realized a grain + some roasted veggies + a killer sauce is the key to using up loads of vegetables in one healthy bowl of goodness. This recipe is super simple with one exception: finding white miso if you don’t already have some on hand. Head to the co-op and pick up a jar. You won’t regret it! Kohlrabi Carrot Slaw with Smoked Tuna // Carrots, Kohlrabi // I recommended this recipe next week and told you to substitute the daikon for the kohlrabi. Well if you didn’t do that, then here is another opportunity (but this time you can use that lovely kohlrabi!). If you’d prefer something pickled, check out this great recipe for Sesame Noodle Bowls with Lemongrass Meatballs and Picked Carrots & Daikon and substitute kohlrabi for the daikon. Yum! Kohlrabi Fritters with Garlic & Herb Cashew Cream // Kohlrabi // Kohlrabi doesn’t need much work. You can just peel it, cut it up and nibble it raw like an apple. It’s the snackiest vegetable you’ve got in this box after the carrots. But in case you want to make something with it anyways, let me introduce you to a totally simple work of art: kohlrabi fritters. Yum! Tempura Green Beans with Old Bay & Lemon // Green Beans // Anyone in need of a project on one of these gray dreary days? Don’t worry, I’ve got you covered. Tempura-ed green beans are one of my all-time favorite treats but I would never suggest them in summer when life is busy and food projects are the last thing you want. Well now that you are nearing the end of the CSA season it is time to savor every morsel in fun and creative ways. Tempura green beans here we come! Sweet Potato Curly Fries with Yogurt, Sriracha & Cilantro // Sweet Potatoes // Zoodling is the trick to perfect curly fries. Every damn time. I’m just full of rainy day activities to keep you all occupied. Plum Tomatoes (Full Shares Only) // Store at room temperature for up to a week. Do not refrigerate. Use heirlooms or blemished tomatoes much more quickly, within a day or two if you can. Colored Bell or Italian Frying Pepper or Oranos // Refrigerate peppers, unwashed, in the vegetable drawer. Moisture makes them spoil faster so don’t store in a plastic bag. Jalapeno //Hot peppers keep well in the fridge, especially in the crisper drawer. I often keep hot peppers in a plastic bag so that they don’t spread their heat or flavor to other fridge items. Broccoli (Full Shares + a couple Half Shares) // Store in the crisper drawer of the fridge. The colder the better for broccoli. Try to use within a few days. Brussels Sprouts (Most Half Shares) // Take out of plastic bag and store in a bowl or open container in the fridge. Do not trim or discard outer leaves before storage. Brussels sprouts should last up to a month this way. The outer leaves might get a little shriveled but you typically remove them anyway. Red Napa Cabbage //For maximum storage, remove any wilted or browning outside leaves, place in a plastic bag and store in the fridge. Butternut Squash // Store winter squash in a cool, dry place and try to use within a week or two. Do not store in the fridge! This will cause it to spoil much more quickly. Daikon Radish //Daikon always seems to last for forever in the crisper drawer of my fridge, especially if it has not been cut. It will get a little soggier the longer you store it, but will still work quite well pickled. You within a month and you should be a-okay. Mint // Store in the fridge in a small glass with about an inch of water, stem side down (like flowers in a vase) for best storage. Well it would appear we have re-entered monsoon season and I can hold firm to my opinion that this sixth growing season just has no desire to cooperate when it comes to weather. We’re used to falls that are crisp and cool, full of blue skies and lingering afternoons spent harvesting because we want to spend as much time outside as humanly possible. We had several days like this: several truly beautiful days. Luckily, we savored every minute and got an incredible amount of work done before things took a turn towards the dreary. Before the rains, we got four of five beds of sweet potatoes out of the ground. A task you’ll know is no small feat if you read last week’s newsletter. The yields were a little lower than we expected but since it was our first time growing them and we also had to plant them into a new field with heavier, more compacted soils, we’ll very much consider this crop a victory! We already feel like we know what the plants need to thrive better and can’t wait to experiment in a new field next year. We also mowed pretty much everything, got the rest of the early fall cabbage out, weeded all the young greens and got the first tomato trellis down (just tomatillos, cherry tomatoes and plum tomatoes to go). We’re feeling right on track despite the miserable weather and just hoping for no more Madison flooding and no more rot issues. And even with the dreary weather, we still consider ourselves lucky. Mostly because that surprise late September frost on Friday night missed us. We spent Friday afternoon covering hot peppers, baby lettuces and green beans just in case but our little northern valley kept things warm. Our hillside takes forever to warm in the spring, which drives us mad with anticipation, but on the flip side, it also takes forever to cool and freeze in the fall which is truly wonderful. Every piece of land has its quirks and it’s mysteries. It’s been fun discovering ours. We also harvested plum tomatoes on Friday- just in case the frost did come- and we expect these to finally be the last. For those of you still receiving tomatoes, you may wonder how the heck this works since we told you a good month ago that the abundant rain had led to a disaster of a tomato season. That’s still true. It was a very short, very light tomato season in general, but the great thing about purchasing a CSA from an increasingly experienced grower is that at least some of the nasty weather has been planned for. It’s still Mother Nature. We can’t foresee every obstacle or fluke weather pattern, but we can recognize over five seasons of production that our tomatoes start late because of their spot on a northern facing slope and end early because of abundant late August rains that are increasingly becoming a new Wisconsin way of life. Though the August rains have never before been quite so strong, we still knew that we needed a late planting of tomatoes that was resistant to cracks and splits as well as strong against disease. Cherry tomatoes, slicers and heirloom tomatoes all ended way early since they are not resistant to any of those things. Heirlooms especially are incredibly susceptible to disease. But we mediate that potential loss with a late planting of plums. Plum tomatoes generally don’t get hit too hard by disease. They also come on heavy and stay strong for 5-6 weeks. They have the added benefit of being hardy as hell. They’re a firm tomato that generally won’t crack, split or show any sign of age. They’re tremendous. But we know they don’t taste quite as delicious as their cherry, heirloom, and sliced tomato counterpart so we don't exclusively grow plums. We plant them late so they produce when most other tomatoes are beginning to fizzle out. It’s a strategy we can’t take credit for. We learned it from Kyle’s time at Tipi Produce up the road. What long-time members might notice is that these are the most rough plum tomatoes we’ve ever grown. We’re so grateful to still have tomatoes to give but we know they’re not perfect. The fact that the plum tomatoes have been showing signs of disease just goes to show how crazy of a season this has really been. And how much moisture there really is in the soil. This season has been one heck of a ride and we can’t believe after today’s delivery there’s only two more boxes to go! If you want to keep your season going a little longer, be sure to check out our fall storage share. There are only 23 spots to go! Use discount code FALLLOVE10 for $10 off any order! Daikon is not all that different from a regular radish (crisp and sweet with a little bit of spice). The main difference is just that it’s MUCH larger. Daikon can get anywhere from 3-15 inches long. You can enjoy them raw, sliced, shaved, or cut into matchsticks. They add a great crunch to pretty much any dish with just a very subtle spice. I especially love to pickle them and toss them on sandwiches or grain bowls. Have fun experimenting and if you want to learn more about this unique veggie: head over to Food 52 where they give you loads of information and ideas for how to use it. Napa cabbage is not so different than regular cabbage. It's a member of the brassica family (along with broccoli, cauliflower, turnips, Brussels sprouts and so many of our favorite veggies). It comes in a head, loves cool weather and stores exceptionally well. What makes it different is the oblong shape and much more tender leaves. The taste is a little sweeter and milder than regular cabbage while the texture is a bit softer. It cooks down much easier than regular cabbage, but I think where it really shines is in its raw form. This particular Napa cabbage is a red variety which doesn't change the flavor much but does make it more striking and beautiful. There are a few recipe suggestions listed below (I’m obsessed with the steak noodle salad!!! ), but check out this link at Food52 for more options! In a medium micro safe bowl, combine squash and 2 tablespoons water. Cover with vented plastic wrap, microwave on high for 4 minutes, stir, microwave for another 4 minutes or until very tender. Mash squash, set aside. In a large saucepan, melt butter and saute’ mushrooms and onions until tender. Sprinkle flour over mushroom mixture, cook and stir for 1 minute. Add milk and small amount of salt and pepper. Cook and stir until thickened. Remove from heat, stir in squash & cooked pasta. Pour half into greased baking dish. Top with half of cheese. Repeat layers. Top with bacon , bake for 20 – 25 minutes, until golden and melted. Rejuvenating Winter Broccoli Salad // Broccoli, Sweet Peppers, Carrots, skip the Kale if you don’t have any leftover or try it with Napa Cabbage // This gal is really trying to take the lead for my favorite blogger. Her salads are some of the most beautiful things I’ve ever seen and there are always 3+ CSA veggies in every one. It also isn’t quite the time of year for citrus or pomegranates yet, so feel free to substitute apple and/or dried cranberries/cherries if you prefer. Weeknight Steak & Rice Noodle Salad // Napa Cabbage, Daikon, Mint, skip Cucumber (unless you happen to have one) // This recipe is a dream. Healthy, simple, exotically flavored in ways you might think you’d only get at a restaurant, and packed full of CSA veggies. I made this recipe in June for the first time and have been waiting desperately for our fall Napa cabbage every since. BBQ Butternut Squash & Pulled Pork Pizza // Butternut Squash (or Sweet Potatoes), Sweet Peppers, sub Jalapeno for Poblano // CSA members Skip & Lindsey first gave me the idea for this pizza several years ago now and I’ve been making it every fall. There is just something so decadent about a pizza HEAPED (and I do mean heaped) with BBQ pulled pork and sweet butternut squash. .
Roast Salmon & Broccoli with Chile Caper Vinaigrette // Broccoli, Jalapeno // I may be so obsessed with this recipe because I have a freezer full of salmon and a fridge full of jalapenos, but I swear to you, once you try this recipe you will never go back to plain old broccoli. It will be roasted and a little charred for the rest of time. And you won’t regret it. I love the simplicity and big flavors of this Bon Appetit favorite. Slow Cooker Beef & Sweet Potato Chili // Sweet Potato or Butternut Squash, Sweet Pepper, Fresh Tomatoes if you got them (instead of canned), add some Jalapenos, feel free to add some carrots too // With this cool, dreary weather, a giant batch of chili is definitely in order. I pretty much always add sweet potato or butternut squash to my batches of chili now. It is just the bit of sweet complexity regular old chili always needed. Penne with Brussels Sprouts, Chile & Pancetta // Brussels Sprouts, Garlic, Jalapeno // If you got Brussels sprouts in your box this week (only a handful of you did), here’s a super simple weeknight pasta to make with them! Miso, Sweet Potato & Broccoli Bowl // Broccoli (or Brussels), Sweet Potato (or Butternut) // The first time I made this dish I actually found it quite boring. Can you even imagine? Since then I’ve realized a grain + some roasted veggies + a killer sauce is the key to using up loads of vegetables in one healthy bowl of goodness. This recipe is super simple with one exception: finding white miso if you don’t already have some on hand. Head to the co-op and pick up a jar. You won’t regret it! Kohlrabi Carrot Slaw with Smoked Tuna // Carrots, sub Daikon for Kohlrabi // Daikon and kohlrabi aren’t so different. Daikon has a bit more heat and spice (like a radish), but it’s still mild, crisp and just the faintest bit funky (just like a kohlrabi). When I first saw this photo I actually thought it was daikon because carrot, daikon and smoked tuna is a match made in heaven. Try it out and see if you can earn to love the simplicity of fresh daikon. If you’d prefer it pickled, check out this great recipe for Sesame Noodle Bowls with Lemongrass Meatballs and Picked Carrots & Daikon. Spicy Kimchi Slaw // Napa Cabbage, Daikon Radish, Carrots, think about adding Jalapeno (depending on how spicy the kimchi you bought is) // Napa cabbage and daikon radish are a match made in heaven, but I didn’t want to give you a kimchi recipe because I know most folks won’t go home and make a vat of kimchi (but if you do happen to want to, check out this great recipe). This recipe calls for prepared kimchi mixed with Napa, daikon and carrots for a light, bright salad that would taste great paired with some ribs or fried chicken. The only veggie it calls for that we didn’t give you is scallions, and I recommend buying some because scallions are an essential part of kimchi. Curried Butternut Squash Soup // Shallots or Leeks (if you still have them), Butternut Squash // Creamy, spicy, sweet, nourishing: this simple soup is a fall gem warming you from the inside out. I bring it to every potluck I’m invited to October and November. Oh, and don’t use light coconut milk. Always full-fat. Always! Plum Tomatoes // Store at room temperature for up to a week. Do not refrigerate. Use heirlooms or blemished tomatoes much more quickly, within a day or two if you can. Broccoli (Some Full & Half Shares) // Store in the crisper drawer of the fridge. The colder the better for broccoli. Try to use within a few days. Brussels Sprouts (Full & Half Shares who do not receive Broccoli) // Take out of plastic bag and store in a bowl or open container in the fridge. Do not trim or discard outer leaves before storage. Brussels sprouts should last up to a month this way. The outer leaves might get a little shriveled but you typically remove them anyway. Fennel (Full Shares + Most Half Shares) // Store the bulbs in a plastic bag in the fridge for up to 2 weeks. Store the leaves in a moist paper towel in the fridge and use within a week. Lacinato Kale (Full Shares Only) // Lasts at least a week if kept moist. Kale doesn’t taste as good once it’s dried out. Keep it in the crisper drawer of your fridge or loosely in a plastic bag to seal in the moisture. Rainbow Chard (Half Shares Only) // Do not wash chard before storage. Wrap in a plastic bag and try to remove most of the air from the bag. Store in the fridge and try to use within a few days. Mixed Bag Potatoes // Store just like you’d store any bag of potatoes from the grocery store: in a cool, dark place. Out of the light, they should keep for at least a month. Radishes (Half Shares who did not receive fennel) // Store for us to 2 weeks in a plastic bag in the fridge. Store greens separately, ideally gently wrapped in a damp paper towel. Use the greens as quickly as possible. Leeks // Store in the fridge and try to use within a week. Store in a plastic bag for best storage. Shallots // Store in a cool dark place until ready to use. These have been cured and should store for months, though you should use within a month for best quality. What a truly magnificent welcome to fall weekend (discounting the Packers game). The weather couldn’t have been more perfect for working (and playing) outside. We took the weather as an indicator to get out to the farm and finally finish digging the potatoes!! On Friday and Saturday, we dug up the last two beds of potatoes: two hundred feet of truly beautiful Oneida Golds. It was our first time growing this variety and we’ll definitely be growing it again. It yielded almost double what the other beds did and it means more potatoes for you! We weren’t sure if we’d be able to put regular potatoes in your box again this week but this “bumper crop” allowed for it. We’ll wait a week to give those sweet potatoes which will only enhance their sweetness and flavor. We started digging the sweet potatoes on Monday. It proved just about as difficult as we thought it would. We’ve never grown them before so we didn’t really know what we were doing. We knew most farmers planted their sweet potato slips into plastic. Sweet potatoes are actually a tropical plant so they want it to be super wet and super hot. The plastic around them creates that environment while having the added benefit of suppressing weeds. We don’t use plastic on our farm. We know it makes life easier and perhaps one day we’ll move to this reality, but for now, we are really focused on keeping as much plastic out of our production as possible. Instead we use landscape fabric that has to be stapled down. It creates much of the same effect as plastic but is a bit more difficult to get up at the end of the year. Weeds tangle around the edges and you have to roll it back up for reuse instead of just tearing it away. We used landscape fabric in our sweet potato field and getting that out of there pre-harvest has been a feat. We had to top the sweet potato vines (since they are covering both the fabric and the staples that need to be removed pre-rolling), then remove the staples, move the fabric off to the side, and then dig the sweet potatoes. We made it through two beds on Monday night before the Tuesday rains. And then we had to figure out how to cure them. Sweet potatoes can be eaten straight out of the ground but then they are going to taste more like an extra starchy potato. Sweet potatoes need to be cured to turn some of those starches to sugar and give them their sweetness. Again, because they are a tropical plant, these babies want to be cured in a hot and steamy environment which obviously fall does not provide. We still have winter squash curing in the greenhouse so we didn’t want to crank the heater up to 90, but even if we didn’t, we weren’t sure how to get the greenhouse super humid. Instead, we stacked crates of sweet potatoes into our newly built germination chamber (another farm space intended for making things hot and steamy). It’s not huge so we can only cure a few crates at a time, but we can use a bucket heater (in a bucket of water) to get the temperature and humidity high for optimal curing. All of the above is why Kyle always said no when I begged to do sweet potatoes in the past. In this, our sixth year as growers, we finally feel like we’ve gotten enough of our production under control that we can give this new complex crop a try. Fingers crossed everyone! Things are looking great so far! The yields are a bit less than we expected (likely because of our very heavy soils; sweet potatoes much prefer sandy soil), but still looking like we’ll be able to give them to you easily for two or three boxes!! Speaking of new crops, you may remember there were two new crops we were over the moon excited for this year. Sweet potatoes were one of them. Do you remember what the over one was? Did my enthusiasm sell these beauties a little too hard in the spring only to totally screw up the crop throughout the summer? Have you been waiting anxiously all year for the tomatillos? Yes, that’s right, we somehow are doing a fine job at sweet potatoes (a crazy complex crop) and a miserable job at the crop that literally grows like a weed (tomatillos). Our tomatillo mistakes were few, but significant. The actual plants grew beautifully putting out loads and loads of small paper-skinned tomatillos. The issue was that we didn’t lay landscape fabric between the rows in an effort to not lay down too much fabric this year (because it is a beast to take up in the fall). Our theory was that we could put the tomato and tomatillo rows far enough apart that we could mulch directly around the plants and then mow the weeds that grew between the mulch. We did this with the tomatoes. It didn’t work perfectly, but it worked fine. But with the tomatillos, we didn’t really know how they grew. We didn’t know they sprawled out like a bush instead of vining up like a tomato plant. Even with trellising, they still drooped and spread over the ground where we wanted to mow thus allowing the weeds to grow and crowd out the plants. Once we did decide to mow anyway, we massacred half the plant and fruits and the weeds pretty much took over anyway. We got about 10 pounds a week this September, not enough to ever give to CSA and instead sold them to a local restaurant. But now we know what to do differently and can pretty much guarantee these lovelies will make it into the box next year! Prick each sausage in a few places. Heat 1 tablespoon oil in large skillet with ovenproof handle. Cook sausages until browned on all sides and cooked through, 10 – 15 minutes. Remove from skillet, let cool slightly. Slice into ¼” slices when cool enough to handle. Meanwhile, add remaining tablespoon oil to drippings in skillet. Add potatoes, onions, and peppers. Cook over medium heat, about 12 minutes, stirring frequently, until potatoes are almost tender. Whisk together eggs, water and salt. Return sausages to skillet, stirring gently to distribute evenly. Pour in egg mixture, cook over medium heat for about 10 minutes until egg is set on bottom and sides. Heat broiler. Place skillet about 5-6” under broiler. Broil about 3 minutes until top is puffy and egg is just set. Rejuvenating Winter Broccoli Salad // Broccoli, Kale (or Chard), Sweet Peppers, sub half Shallot for garlic, sub Roasted Butternut Squash or Radish for Carrots // This gal is really trying to take the lead for my favorite blogger. Her salads are some of the most beautiful things I’ve ever seen and there are always 3+ CSA veggies in every one. This one calls for carrots, which you aren’t receiving, but roasted butternut squash or radishes will make a fine substitution. It also isn’t quite the time of year for citrus or pomegranates yet, so feel free to substitute apple and/or dried cranberries/cherries if you prefer. Leek & Swiss Chard Tart // Leeks, Swiss Chard (or Kale) // I love pretty much every Smitten Kitchen recipe there has ever been, but I must say her vintage recipes are my favorite. They are somehow even simpler and more elegant than her recent gems. This beauty is rich, hearty, takes no fuss and looks effortlessly beautiful thanks to the frozen pastry. Voila! Dinner is served! Spicy Grilled Chicken with Crunchy Fennel Salad // Fennel, Sub Shallot for onion, Sub Jalapeno from last week for red chile and Sub 1 cored Tomato for tomato paste in sauce for chicken // I’ve been waiting ever so patiently for months until we had fennel to give again so I could share this simple, elegant, super delicious meal where spicy chicken and fragrant fennel share center stage. Those of you who are receiving fennel this week are only receiving one so take this salad recipe and halve it, still using a full shallot for the half onion. You won’t be disappointed. Raw Broccoli Salad with Peanuts & Shallots // Broccoli, Shallots, add Kale if you feel like it // I made this recipe last week subbing rice wine vinegar for lime juice, adding a bunch of kale (which I massaged with the broccoli in the simple dressing, and leaving out the herbs altogether (because I didn’t happen to have any on hand). It was heavenly. Or you could just fry your shallots and eat them all in 2 minutes. Whatever you feel like. Winter Squash & Tomato Gratin // Tomatoes, Butternut Squash, Leek for red onions // I wait all year for the winter squash to overlap with the tomatoes so I can share this beautiful recipe with you! It’s so simple and so tasty. You can use any winter squash and any tomatoes (though the winter squash we gave this week really should be peeled before use). Penne with Brussels Sprouts, Chile & Pancetta // Brussels Sprouts, sub Shallots for garlic, add Jalapeno if you still have one lying around // Only some of you received Brussels Sprouts this week (and not a ton) so I thought I’d include a recipe that stretches these beauties. It calls for a chile pepper, use a jalapeno or poblano if you still have one lying around (or maybe even half of one of those habaneros). Use a bit of colored peppers if you don’t. Oh and don’t forget that pancetta is just a fancy word for bacon; feel free to use that instead. Favorite Kale Salad with Roasted Butternut Squash, Apples & Cheddar // Lacinato Kale, Butternut Squash // I shared my favorite kale salad recipe many newsletters ago. It had tiny pieces of cubed apple and cheddar cheese with a simple lemon juice dressing. Now that it’s fall I’ve tweaked this awesome salad ever so slightly adding roasted squash and a sweet tangy vinaigrette of apple cider vinegar, maple syrup and olive oil. An upgrade suitable for fall indeed! Brussels Sprouts with Harissa & Pickled Shallots // Brussels Sprouts, Shallots // Or if you want to just use all your Brussels in one fell swoop, roast them up and toss them with some harissa sauce (spiced with tahini and loads of earthy seasonings) and quick pickled shallots. It will be too many shallots but guaranteed you can use them on pretty much anything. Leek & Pepper Pretzel Dip // Leek, Colored Pepper, Jalapeno // Many thanks to CSA member and worker share Amy who reminded me putting random vegetables into cream cheese is ALWAYS a great idea. Leeks, jalapenos and a sweet pepper (if you still have one lying around) are a match made in heaven. Mashed Potatoes with Caramelized Fennel // Potatoes, Fennel, add Shallot for second fennel bulb // Just like onions, fennel tastes stupendous caramelized. I know you’re probably thinking it will still be a bit too strong of a flavor served any which way so here it is tossed into a giant vat of mashed potatoes thickened with butter and cream. The decadence offsets the strong fennel flavor for a complex yet delicious batch of mashed potatoes.